Approximately, 2% of American population are suffering from psoriasis – an auto-immune and chronic skin disease. People suffering from this condition produce skin cells 10 times faster than normal. However the shedding of old skin cells stays normal. This leads to the formation of thick, scaly, dry and itchy patches on the skin. Immunity, stress, obesity, certain medications, diabetes are some of the conditions that can worsen the psoriasis. This skin condition cannot be cured completely yet it can be controlled to a maximum extent with some natural ingredients like essential oils, coconut oil, apple cider vinegar or tea tree oil. In this article, let’s see various essential oils that are helpful in reducing psoriasis. It is one of the versatile oils which is helpful in treating many skin ailments that include sores, sunburns, psoriasis, boils, bruises, acne, abscess and many others. It has anti-inflammatory and calming properties which heal the psoriasis to a maximum extent. It soothes the dry, itchy and flaky skin. It rejuvenates the skin and promotes the healing. It blends well with other oils like clove oil, sage, pine, geranium, vetiver and patchouli. Tea tree oil is a multifaceted and powerful resource for treating psoriasis and other skin ailments. It contains anti-viral, anti-bacterial and anti-fungal properties. It reduces inflammation and stimulates the immune system to improve skin health. It soothes the dry skin and controls the excess production of skin cells. Its deep penetrating power helps to reduce and prevent the appearance of psoriasis scars. Myrhh contains powerful healing properties which soothe the dry, itchy, flakey and cracked skin. It effectively eases the symptoms of psoriasis to a maximum extent. It contains antibacterial and anti-inflammatory, antifungal and anti-septic properties. Apart from that, it has deep penetrating power which support healing process and speed up the restoration. Cedarwood is an effective remedy for reducing the psoriasis. It helps to cleanse the impurities. Its diuretic properties treat cellulite, fluid retention and toxin accumulation in the body. Its astringent properties keep the skin tight, reduce excess skin cell production and soothe the itchiness. Angelica is considered one of the excellent detox oils. Its diuretic properties helps in clearing out and remove of toxins and waste accumulated in the body. It is very helpful in clearing the skin congestion. It boosts the immune system, clears cellulite and improve the functioning of liver. People suffering from psoriasis should address the problems related liver functioning. This essential oil contains antiseptic and skin-smoothing properties. Its amazing skin-healing capacity helps to heal the damaged skin tissue. It contains strong naturally occurring anti-inflammatory properties which makes it perfect for treating psoriasis. It can be blended with other carrier oils like jojoba oil or sweet almond oil. Chamomile essential oil stimulates white blood cell production and heals the skin condition. It improves skin elasticity and helps to dry the flaky skin. Its healing, anti-inflammatory and deep penetrating capacity helps to heal the skin condition very effectively. You can add few drops of it into your bath water or apply it by diluting any carrier oil like jojoba oil, sweet almond oil or olive oil. Being highly toxic, thyme essential oil contains potent antiseptic and anti-inflammatory properties that are helpful in treating skin conditions like psoriasis. It can be applied directly or by diluting it in any carrier oil. People with high blood pressure levels and pregnant women should avoid using thyme essential oil. Geranium essential oils works wonders in revitalizing the body tissues. So, it is considered one of the best essential oils to treat psoriasis. It can be applied directly on the psoriasis affected areas or consumed in very small quantities. Due to its calming and soothing properties, rose essential oil is often considered one of the best oils to treat psoriasis. It also contains anti-inflammatory, antiseptic and anti-bacterial properties. This oil should be always diluted instead of using it alone. Juniper oil is very effective in stimulating blood circulation and blood purification which are helpful in treating psoriasis. It can be diffused, inhaled, applied topically to treat psoriasis. People with allergies, pregnant women and kids should avoid using juniper oil. Sandalwood essential oil is effective in balancing both emotions and immunity processes in the body. The high amounts of santalol present in it makes it useful in relieving the inflammation. It can be either diffused or applied topically to get relief from psoriasis. People with hypersensitive skin and expecting mothers should avoid using this oil. This essential oil is very effective in treating psoriasis as it contains many beneficial properties. It can be either applied topically or consume in food doses to treat skin ailments. It should be diluted properly before applying it on the skin. Patchouli or Agastach pogostemi oil is very effective for treating skin conditions like psoriasis. It can be either applied directly on the skin, blend with other oils or consumed in very less amounts. Bergamot essential oil has calming effects which reduce the itching and flaking of the skin. It can be applied directly on the skin or diffused in the air. It is safe for even kids. Andiroba contains myristic acid which helps in overgrowth of skin cells. The linolenic acid present in it restores regular life cycle and control the production and expansion of skin cells. Borage essential oil contains enough amounts of gamma linolenic acid which is very helpful in treating various skin ailments including psoriasis. It can be blended with any other essential oils to boost its effectiveness. Cajeput essential oil energizes the skin cells and also acts as light counter-irritant. It also helps to ease the irritation caused by psoriasis. It contains anti-inflammatory properties which are helpful in preventing skin infections that are caused by psoriasis. This essential oil contains Gamma Linolenic acid which is very effective in treating skin ailments like psoriasis. It can be blended into any carrier oil or essential oils to make a perfect mixture for treating psoriasis. Jojoba oil is one of the traditional oils used to treating or managing psoriasis. Being similar to natural sebum, it acts as an amazing moisturizer which helps to treat dry and flaky skin. It is a healing tropical oil which helps to treat psoriasis and other skin ailments. It acts as one of the soothing and calming moisturizer. Melrose oils contains potent anti-inflammatory and antiseptic properties which are helpful in treating psoriasis. It is also helpful in regenerating damaged skin tissues. You can apply it directly on the affected areas or dilute with any carrier oil. The essential properties of peppermint essential oil can tackle with itching, redness and dryness caused by psoriasis. This oil should be applied in very small amounts. You can just apply 1 drop of the peppermint oil the affected areas and leave it to dry completely. Alternatively, you can add 5 drops of essential oil into a cup of distilled water and spray it on the affected areas. This essential oil contains anthelmintic, anti-inflammatory and antimicrobial properties. It helps to treat various skin problems including psoriasis. It also soothes the swelling, moisturizes the skin, reduces the thickness and fastens the healing process. Here are various ways you can try to blend several essential oils for treating psoriasis. These blends are effective in controlling the symptoms and prevent infection associated with psoriasis. You can opt any one of the blends and try it regularly to get relief from the psoriasis symptoms. Into a glass bottle, add 1/2 cup of grapeseed oil or almond oil. 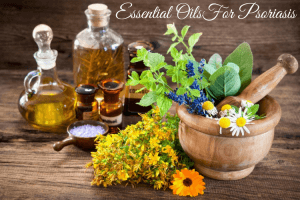 Now, add 15 drops of tea tree oil, 30 drops each of borage oil and evening primose oil, 10 drops each of thyme oil, bergamot oil and niaouli oil. Add enough amounts of oil into you bath water and soak in it for 15 – 20 minutes or else apply it on the psoriasis affected areas for several times in a day. This process yields a thick blend which easily spreads on the skin and provides relief from the dry and flaky skin. In a glass bowl, combine 15 drops of tea tree essential oil, 5 drops of myrrh oil and 5 teaspoons of avocado oil and borage oil or evening primose oil. Apply enough amounts of mixture on the psoriasis affected areas and let it dry completely. Repeat the application 2 times in a day for relief. This formula is not only effective in treating psoriasis but also helps to cure eczema to a maximum extent. Combine 4 ounces of vitamin E cream, 20 drops of lavender oil, 4 drops of bay essential oil and 5 drops each of carrot seed oil and geranium oil. Note: Add 1 teaspoon of castor oil if you think the essential oil mixture is too potent for your sensitive skin. If you want to get relief from scalp psoriasis then this method works best in treating it. Combine 5 teaspoons of apple cider vinegar, 3 ounces of lavender essential oil and 10 drops each of lavender oil and tea tree oil. Pour the solution into a glass bottle, close the lid and shake well. Using a cotton ball or finger tips, apply the mixture on the scalp. Leave it on overnight and rinse off in the morning. Repeat the treatment 2 times in a week for effective results. This process is helpful in treating the psoriasis affected areas that are difficult to reach. The properties of Epsom salt provide relief from the itching, redness and dryness of the skin. Into a bathtub filled with water, add few handfuls of Epsom salt. Add few drops of essential oil into the water and stir well. Soak in it for 15 – 20 minutes and rinse off with water. Repeat the process daily to get relief. If you have been suffering from itching and burning of psoriasis flare-ups then you can try this process. This process can be make the situation a little worse before it starts to improve. Combine 1 cup of oats, 1 cup each of baking soda and corn flour. Add the mixture and 1 cup of apple cider vinegar into the bathwater. Mix well and soak in it for 15 – 20 minutes. Rinse off normally and pat dry. Repeat the process 5 times in a day. Into bathwater, add 4 drops of lavender oil, 2 drops of german chamomile, 1 teaspoon of olive oil, 1 teaspoon of jojoba oil, 1 cup of oats and 1/2 cup of Dead Sea salt. Mix well until the salts get dissolved. This cream can be applied on the various areas after taking a bath to reduce the symptoms of psoriasis. Combine 100ml each of seaweed and aloe vera gel, 3 drops of german chamomile, 10ml each of vitamin e oil, avocado oil, jojoba oil and lavender oil, 4ml drops each of tea tree oil and patchouli. Stir well to get the ingredients incorporated and store in an airtight container. Now, add 9 drops of bergamot oil, 1 drop of ylang ylang oil, 3 drops of mandrain oil, 1 drop of clary sage oil, 10 drops of geranium oil, 4 drops of patchouli oil and 10 drops of frankincense oil. Close the lid and shake the bottle to get the oils incorporated. Apply enough amounts of the mixture on the psoriasis affected areas. Essential oils are very potent in nature so we have to be very careful while using them. Some people may be allergic to certain oils, so it is better to patch test before trying any essential oil. If the application is causing irritation, redness or any other discomforts, then it is best to avoid them. Few essential oils are not appropriate for consumption whereas certain oils can be consumed. So learn which oils are good for consumption and which are not. Was the information provided in this article helpful for you? Do you have any other essential oil that works best in treating psoriasis? Share it with us in the comment section below.